Ever since the Syrians invented glass-blowing in the 1st century, the craft has always had a certain air of magic to it, an alchemical process that transforms sand with fire and air into something hard and clear. The magical aspect was the key of Werner Herzog’s 1970s film Heart of Glass, in which the entire cast of non-actors played their roles while under hypnosis. The plot centred around a German glass-manufacturing family, who had forgotten the ancestral secret of making a rare ruby crystal; there are fascinating scenes of men blowing glass before infernal kilns. The Romans were the first in Europe to refine this alchemy into art. Among those who took refuge from the Huns in the Lagoon, there must have been a Roman glassblower or two, even though the first Venetian document to mention one dates from the 980s. The fragments of glass that survive from that period are simple and utilitarian. In the 12th century, however, glassmakers in Murano invented a process of producing glass panes from blown cylinders, which brought Venetian glass its first fame, a technological breakthrough that opened up the façades and let light into the cramped, courtyard-less Venetian palaces. Perhaps the most beautiful products of this functional period are the transparent glasses and lamps, as clear as rock crystal (hence the name ‘crystal’), a technique invented in the 1450s, just in time to illuminate so many Renaissance paintings. Nor was it long before Murano became the first place to mass produce spectacles, useful for reading the first mass-produced books. At the time, the only way to add colour to glass was through lead enamel or smalto, melted over the glass or mosaic tesserae. But a revolution occurred on Murano in the early 15th century when Angelo Barovier (1405–60), a member of one of Venice’s most venerable glass-making dynasties, began to make glass in colours, rediscovering the ancient Roman technique called murrine, enabling glassmakers to create designs by laying cold pieces of different coloured glass together and firing them together in the kiln. The famous Barovier nuptial cup, with its couple bathing in a fountain (on display in the Museo del Vetro) is a superb example of the new art. After that there was no going back – beginning in the 16th century Murano became a laboratory for ever more elaborate designs and techniques: vetro a filigrana, the most original technique from Murano, consisting of thread-like rods of white glass ‘woven’ on to the surface in free-form patterns; vetro lattino or milk glass, imitating Chinese porcelain; vetro a ghiaccio, with a rugged, ice-like surface made by suddenly dropping the temperature in the glass process; vetro graffito, with designs scratched on the surface with a diamond; vetro a pettine (‘combed glass’) or vetro a penne with a wavy design; or the very difficult to make venturina or stellaria glass, shot through with shiny copper crystals. Murano also learned how to make coloured glass that looked so much like semi-precious stones that in the early 1600s a law had to be passed banning the manufacture of false gems. You’ll see examples of these revived traditional techniques on a stroll down Murano’s glass canal; many factories make souvenirs you can take home without embarrassment. 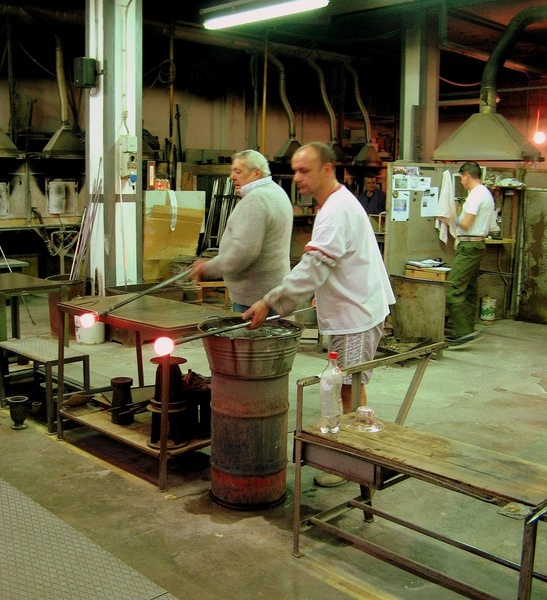 In the 19th century, when the entire industry was in decline, Murano’s glass-makers stayed alive by producing tons of glass beads for European colonialists to trade to the natives in Asia and Africa, a compromise that Murano still hasn't quite recovered from. Today in Murano, alongside an exquisite filigree glass bowl, you can still find simpering green clowns, pink horses and chandeliers dangling glass flowers of death. But it's easier now than it has been in years to find contemporary works of extraordinary beauty.